Skateboarding tribes gather Down Under for the biggest bowl contests of the decade. and equations and defiance against the church, we found out that the Christian notion of center was absolutely irrelevant, because the center of the universe simply does not exist, making an end to the aforementioned question. Suddenly skateboarding became available worldwide. California lost its status as the center of skateboarding and any place with ledges, rails and stairs became the new frontier. Localism and tribalism became the norm and thousands of centers blossomed everywhere like flowers in spring. Now, take a look at any map view from Europe and you’ll see the European continent in the middle and Africa, Russia and America on its edges. Same map viewed on American textbooks shows the USA in the middle of it all with Latin America, Asia and Europe on its outskirts. How about China, dubbed the empire of the middle by its inhabitants? So, let’s think about it, history shows that the center of the Universe is where you stand, where the action is, where other people make stuff happen. No wonder that the center of the universe recently shifted down under: that’s where it’s all happening now starting with Tony Hawk and his Gold Coast Big Day out tour covering NZ and Oz, The ABC Hurley Australian Bowlriding championship, The Wellington Bowl-A-Rama, The Hurley Manly Beach Bowl contest, and The Bondi Bowl-A-Rama, all of this in just one month… What a month! The media frenzy around the Beach Bowl contest in Manly Beach is the perfect example of this infatuation. 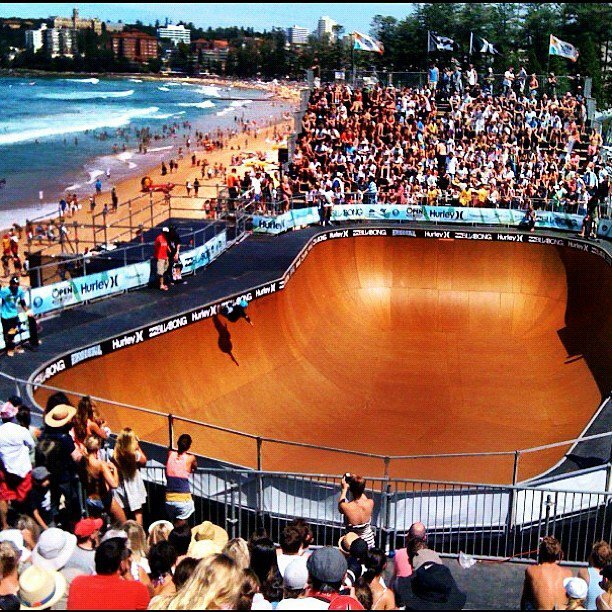 In less than one week, Manly Beach, already posh by design, became The Place where you had to be if you were someone in skateboarding thanks to Facebook that became the amplifier of the Hurley-Billabong powerful marketing machine. Alas, you can’t fit 50 media officials in the deck of the Soul Bowl, so previously accredited core skateboarding photographers were displaced to give place to more mainstream media.